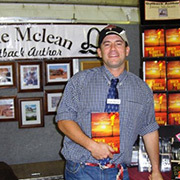 Jame Mclean was born in the early 1970s – the younger of two brothers – into an Outback Queensland family. He followed his father, grandfather and great grandfather onto the land. Being raised on the family property – which is a half hour drive away from the nearest neighbor and houses some of the toughest terrain in this country – he often spent hours alone. His imagination ran wild. He also used to enjoy listening to stories his grandfather – a respected community leader – told him. At age eight, Jame was sent to boarding school in Brisbane (some 1,000 kilometres away), only returning home four times a year. He played football and cricket, participated in athletics and rowed in the school crews, as well as serving four years in the cadets. His ability to spin a yarn was evident from an early age and it saw him writing, directing and starring in a number of school plays. He wrote his first novel immediately after leaving school in 1992 and two more before completing ‘The Greatest Life’ in 2004. Along the way there have been several short stories, some poetry and a screenplay called ‘A Little Piece of Ireland’. All this was completed while Jame was busy carving out a career as a rural contractor in far southwest Queensland. Through record-breaking rains and the worst drought in living memory, his passion for writing has often had to take a back seat to doing what needed to be done just to survive. But Jame Mclean is nothing if not a fighter and this is reflected in his storytelling. Life on the land has led to time on and off farm in both the rural and resource industries, but has blessed Jame Mclean with writing success and fulfillment certainly… but also with family and friends. Jame is a husband and father now that allows life to mean so much more as he builds a future, he has also been blessed with mentors and friendships to remember for a life time.